east side bride: Good Morning, Peoplefriends! I will now be attempting to make quick-pickled radishes. Pretty, aren't they? As I mentioned on Twitter, we're going to a super fun, halfway vegan, semi-glut free, verrrrrrrrrrrry hipster t-giving dinner, and I wanted to bring something a little unusual. Make two separate batches so you know whether or not to split the difference next time! both recipes sound good; i trust d-lebz in all things and think his suggestion of a chile is a good one (that's the secret to the pickled green beans i make). i'd try a little of each; if one fails you've got a backup, and if they both work you get to present them as pickled radishes two ways, which provides that key hipster teeter between thoughtfulness and douchebaggery. I've used several DL recipes, including pickled turnips, and they were all great. The she simmers recipe seems too sugary, but then I generally dislike sweet pickles. it is nice to have something that you can soak up gravy and cranberry sauce. sure you could mod it a little to make at least gluten free? ps, vegan is SO not hipster. but i will try that recipe at some point. i thought being a hipster meant NEVER calling yourself one?? *I'M* not a hipster. I'm just invited to dinner. Yum. Now I'M tempted to make two recipes of pickled radishes. 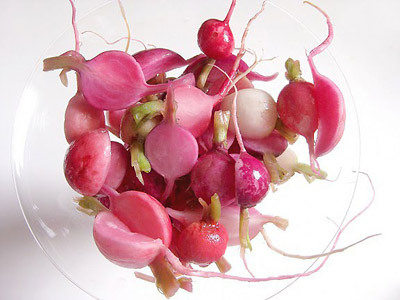 I'm playing hookey from Thanksgiving - pickled radishes sound fun and delicious. in other news, marriage tag? whoopsy i deleted the bit about h being a hoarder/me throwing out all our jars. David Lebovits is the jam. I highly suggest the almond cake on his website. You can easily make it gluten free by finding GF almond paste and subbing the wheat for almond flour. And you get to make it all in your food processor! A "halfway vegan, semi-glut free, verrrrrrrrrrrry hipster t-giving dinner"? Are the readers of East Side Bride seriously too afraid to point out the utter ridiculousness and pretentiousness of this? It sounds like an eating disorders convention. No wonder every outfit posted here is some ugly rag hanging on a skeletal figure. Apparently its no longer cool to eat. Agreed. Also, it's not hipster if you call it hipster. eating disorder convention? OR do you not realize that some people can't actually eat gluten because of allergies and not because it's a fad? Vegan/gluten free is all or nothing. Halfway and semi count for nothing when you have an allergy. You sound irritable. Maybe cutting back on the gluten would help.